*A 55' flatscreen HDTV in the living room and a 40' in the loft. This will be your affordable home away from home. But, please note that if you're looking for luxury or premium accommodations, Copper Junction is not the condo for you. The building was built in 1973 and has not changed much since. 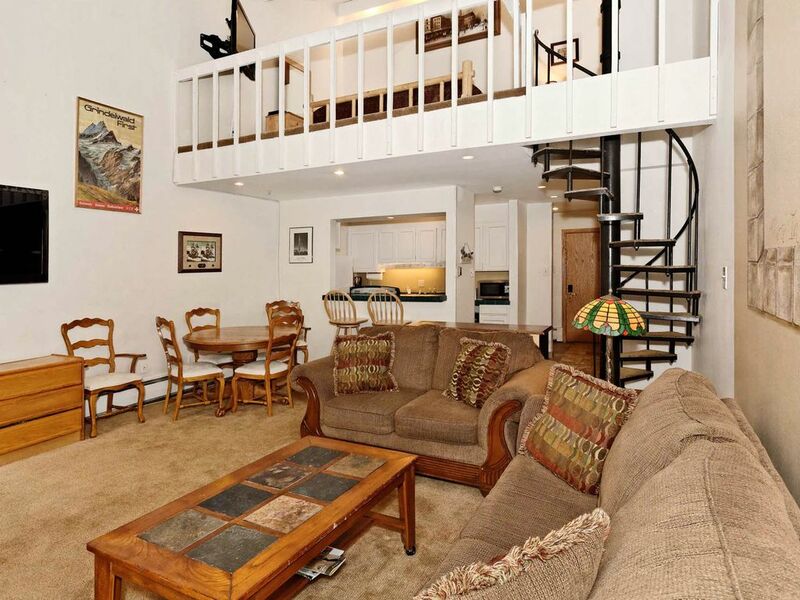 But, if you're looking for a convenient and roomy home for your fully-charged ski vacation, you'll love this unit. Most of our guests love the condo and its location - we have many repeat customers. But those of you who are happiest in upscale, luxury accommodations, then please check out the Cirque or the Cache! In the loft, you'll enjoy a pine log king size bed and a 40' flat screen TV and DVD player. There is not a bathroom on the loft level. On the main level, just inside the condo door, is the full bathroom. In the living room, there is a queen-size sleeper sofa and a twin rollaway bed tucked away behind the fireplace. The sofa-bed is commercial quality and has a memory foam mattress, but sofa beds are best for children. Adults do much better in real beds! There is a 55' flat screen TV with DVD and we offer free high-speed internet (wifi), your own ski locker with combination lock on the ground level, free parking and ski-in, ski-out access. The fully-equpped kitchen offers full-size appliances and all the utensils you'll need to prepare your favorite apres-ski meal. Free parking is located directly underneath the building, and there is ample overflow parking next door in the parking structure. This condo is still pet-friendly. The pet fee is $50 per pet per night. There are no exceptions to the pet fee, even for your exceptionally behaved non-shedding pet. Guests in violation of the pet policy will be charged a minimum of $300. Copper Junction overlooks the Burning Stones Plaza where all the action takes place - concerts, summer activities, movie night on the mountain, loading on the American Eagle ski lift, restaurants, shops and more! Payment/Cancellation Policy - We require a 50% deposit to confirm your reservation and the balance amount is due 60 days before your Arrival Date. Reservations made within 60 days of Arrival Date require payment of lodging total at the time of booking. If you cancel more than 60 days prior to the Arrival Date, we will refund the deposit minus a $100 cancel fee. NO REFUNDS given for cancellations made within 60 days of your Arrival Date. There are no exceptions to this policy. We highly recommend Travel Insurance including coverage for cancellation due to any reason. Unused nights caused by early departure, and/or a reduction in nights, for any reason, are considered cancellations. The full bathroom is on the main level. There is no bathroom in the loft area. Of course! We provide all bedding, blankets and towels. Not inside this condo, but there is a coin-operated laundry room in this building on the ground level. Fully equipped with pots and pans, cooking utensils, dishes, glassware and flatware. You'll enjoy 2 flatscreen HDTV's with cable: a 55' in the living room and a 40' in the loft. Both have DVD players and remotes. This building is a true ski-in, ski-out building. There is no hot tub or pool at this building, but the Copper Mountain athletic club is less than a block away and is $12 per day for adults and $6 per day for kids ages 6 - 17. Kids 5 and under are free. Punch passes are also available at a discounted rate. The athletic club offers a pool, hot tubs, steam rooms, saunas, free weights, weight machines, a spa and more. *Copper Free Ride: 970 556-8687** In addition to the existing free Copper shuttle busses, the Copper Free Ride provides door-to-door, on-demand, transportation for skiers and riders, and is an open-air electric cart, holding 6 passengers. It is available from 8:30 to 11am and 3 to 5:30pm. The vehicle can be flagged down by guests desiring a ride, or the service can be requested by calling 970 556-8687. Riders should call 15 to 20 minutes prior to the desired pick-up time.